Please plan to attend Atlanta Chapter’s January Luncheon on Friday, January 16, 2014, at 11:30 a.m. 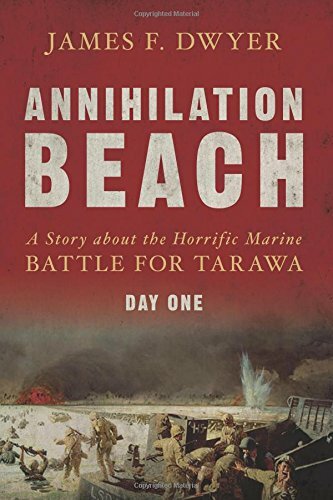 The January Luncheon will feature James Dwyer, bestselling author of Annihilation BEACH; the story of the Battle of Tarawa, with the incredible horrors and the distinguished heroism of a platoon of marines who must fight their way ashore and then battle the Japanese defenders in their hidden bunkers and foxholes! The Atlanta Chapter’s January luncheon is scheduled for Friday, January 16th, 2014, at 11:30 a.m., at 57th Fighter Group. For directions, visit the chapter’s website: atlanta.usnaaasiteadmin.net. Lunch is priced at $20 for members and $25 for non-members (a great opportunity to become a member and save $5) and as always, exact change is always appreciated. Feel free to bring guests and encourage slacker classmates to join us.